The city of Cairo has no equal in possessing so immense historical legacies of architecture in the vast Islamic world. Since the first town of Fustat (now Old Cairo) was established in 642, Cairo has been thriving for more than 1300 years as the core city to rule Egypt and its periphery, concentrating great wealth on it and constructing all sorts of religious and secular buildings. It is quite strange that it is solely Cairo; there are no other cities in Egypt that possesses historical Islamic edifices to visit. Additionally a large quantity of edifices were built too densely in Cairo, so it became quite difficult to get regular spacious lands to construct new buildings even for the royal facilities, except at the foot of the Muqattam Hills. Since every site was cramped and of exceedingly irregular or distorted shape, like those in the current congested city of Tokyo, often buried in urban fabric, one could not see the external appearance of the building except its limited facade facing the front street. 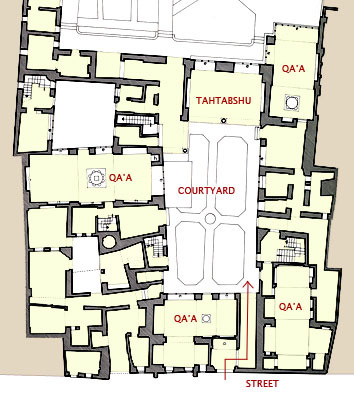 One more reason for that, even though not restricted in Egypt, is that the houses were of courtyard-type. Since ancient times before the rise of Islam, in the desert climate of the Middle East, people have been exclusively retaining introverted house-form and life-style in order to protect themselves from the harsh forces of nature on humans, closing the land periphery with thick walls. They had no windows except entrance doors on the outer walls, gaining light and air entirely through courtyards. Since this traditional method has been succeeded not only in private houses but also in all kinds of buildings that Muslims needed, every building-type has come to take the introverted plan centering on a courtyard; mosques, madrasas, palaces, etc. That�fs why we encounter pretty dull feeling, when walking in a residential district, finding only tall impassive walls continuing on both sides of narrow winding streets. However, once inside of a house through an entrance portal, we can find another sphere enclosing a courtyard, devised by various ideas to make it as comfortable as possible. Among diverse building-types in Islamic architecture, a house is the sort that is incessantly altered and eventually rebuilt in a relatively short cycle; therefore even Cairo does not retain so many traditional old houses. The best-preserved house among them is the Suhaymi House facing a byroad from the main street in the old Islamic area (Al-Qahira), Muizz Li-Din Allah Street. Despite it being an individual house, it is a three-storied large mansion built of stone, rather considered as a small palace with a character of mini-Alhambra. The courtyard, even though it has no waterways, forms a sort of quadripartite garden (Chahar Bagh) with a fountain in the center; just an oasis in the urban area. One goes into the courtyard through a bending passageway from the front street, which protects its privacy. Instead of the cloisters of the Alhambra there is a portico called Tahtabsh in the bottom of the courtyard and a terrace facing north called Maq�fad on the 2nd floor, both of which are the half exterior spaces for the patriarch to receive visitors or make himself comfortable in the shade. As it demonstrates, it is characteristic that the whole house is composed of public open spaces for men (Salamlik) and private closed spaces for family members (Haramlik). The main spaces of Haramlik (Harem in Turkish) are halls referred to as �eQa�fa,�f which has a high ceiling and a sunken center often furnished with a water basin. A fountain carries out the role of air-cooler and its sound is background music. In winter a charcoal brazier was settled instead. What attracts our notice most is wooden delicate latticework (Mashrabiyya) placed on all windows. This is equipment to prevent intense sunlight and dust blown by wind and to let cool breeze go through during Cairo�fs hot summer, in addition, it is also a veil through which women can look at the scenes of the courtyard and street without being seen from the outside. There are many Qa�fas on every floor in the extensive Suhaymi house, but the function of each Qa�fa and other rooms are not fixed. In order to live suitably in a tough climate, the residents move from one room to the next according to the season of the year or time zone of the day. The room, the function of which is determined exceptionally, is the curious Hammam (steam bath room) on the 2nd floor. It gets fantastic lights through small colored glasses inlayed on the ceiling dome scattered like a constellation.